Made from golden tan fabric covered with branches, leaves, and nuts, this tarot bag is likely to appeal to anyone that follows an Earth-based religion. 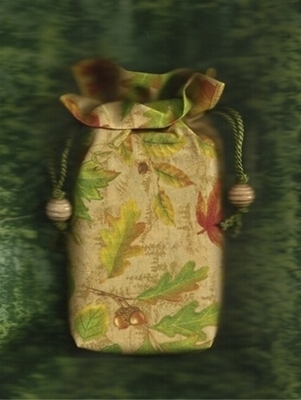 Such a bag is bound to enlist the help of the little folk and nature gods and goddesses. Fairy decks, Wiccan and Druid decks, floral or animal-themed tarot cards - they will all flourish under the protection of the oaks. Bag Design: Our double draw bags close with two twisted cord drawstrings that create a 1" ruffle effect when closed. The bottom of the bag is slightly squared off (gusseted) to better fit a deck of cards. Size: Measures about 4-1/2" x 7-1/4" x 1" (approx. 11.4 x 18.4 x 2.5 cm). Fits most card decks that are 3-1/4" by 5-1/2" and less. All of our bags are individually handcrafted with care to ensure quality. Please allow for slight, natural variations in size of the bag and pattern placement.